Manchester United captain Wayne Rooney scores in the 3-1 win against Newcastle at Old Trafford. 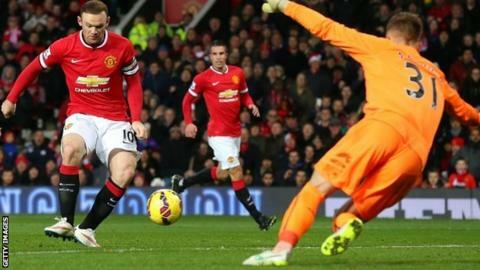 Manchester United manager Louis van Gaal says he could have asked for no more from Wayne Rooney, who played in midfield for United's 3-1 win over Newcastle at Old Trafford. Rooney scored twice and created a third for Robin van Persie. And Van Gaal was delighted with the 29-year-old's contribution as his side took their unbeaten run to eight games. "He scores two goals and gets an assist," Van Gaal said. "What more can you demand as a manager?" The Dutchman added: "In our last match against Aston Villa Rooney was a little bit too defensive so I asked for him to be more attacking. "He has the lung capacity to run 90 minutes as a midfielder." Although he has tended to be used either as an orthodox striker, or in an advanced role just behind a front two this season, Rooney has been picked in central midfield for United's last three games. The move has coincided with the combined absences at various points of Angel Di Maria with a hamstring injury; Marouane Fellaini with a virus; plus central defensive duo Chris Smalling, who returned to the bench against Newcastle after recovering from a groin strain, and Marcos Rojo, who has a thigh injury. Rooney, 29, is just six goals away from becoming the Premier League's second highest scorer. Robin van Persie, Juan Mata and Radamel Falcao have started the last two games as the front three. With Rooney, the quartet are responsible for all seven goals United have scored. "I can also use him as a striker but for the team it's better he plays in midfield at the moment," Van Gaal said. Rooney, who has scored eight times in his last eight games for club and country, has spoken in the past about his preference to play as a striker. It put him into conflict with previous manager, Sir Alex Ferguson, who felt Rooney had all the attributes needed to be an effective midfielder. "Wayne Rooney's all-round game is exceptional. I think for the last 18 months since Paul Scholes retired there has been a massive hole in that Manchester United midfield. Rooney has such intelligence and today he was fantastic. He has the ability to run from box to box, he has great energy, great enthusiasm, he has the intelligence to move into space and score important goals. He is thriving in this deeper position." Rooney's frustration at repeatedly being used in midfield lay behind his decision to ask for a transfer in the final weeks of Ferguson's time in charge. There is no suggestion of similar disenchantment at present, even though Rooney's status as a striker is unquestioned within Roy Hodgson's England squad. For now, the forward is happy to field questions about a comparison with Paul Scholes, a striker in his youth days but who eventually went on to become one of the most influential midfielders of his generation. "Paul could see the ball when it was wide, see the space and run into it," Rooney said. "The manager has given me even more licence to get forward and get into the box. "It is a role I have played many times."